Trying to pack lightly (and smartly) for holidays ! I don't know how people do it. You know those people that you see walking onto a plane with only their carry on and you can see quite obviously that it's not even packed to the brim. There's wiggle room and plenty of it. I, however, am a completely different traveler. I hate packing with an absolute passion but am also very good at it. That is, if your definition of being a good packer is managing to squash everything you need and plenty you don't need into your suitcase. You know that if they were to weigh your carry on that it would be as heavy as your checked luggage. Last year I wrote about what I brought to Spain with me versus what I actually used and since I'm only going for five days this time, I thought I'd try a different tactic. I'm just bringing carry on with me. We're bringing a bigger sports back to bring stuff home with us but I'm going to attempt to limit myself to the carry on. Soooo what I'm going to show you today is how to pack lightly and (hopefully) smartly. I've picked out some products that have multiple uses, so you can bring less away. Let me explain. First up is Coconut Frosting from Philosophy (€17.50 from Arnotts). Not only is it a shampoo, but it's also a shower gel and a bubble bath. I won't be having baths in Spain but I will wash the aul gruaig and my bits and pieces. I won't be bringing this massive bottle with me because I'm only going for five days. Instead, I'll be a smarty pants and decant some into one of those plastic bottles I picked up in Penneys recently. I get to smell like holidays whilst on my holidays! I've been using Coconut Frosting on my hair and am in The Love with it. Full review to follow. Next up is a bit of skin care. Human + Kind all-in-one anti ageing cream (€29.99) is a day cream, night cream, eye cream and an anti wrinkle cream all in one. Read my full review here. I can't believe I haven't blogged about this next product yet and will do it justice when I come home with a full review. It's Emma Hardie's AM/PM Professional Moisturising Cream (€43 Arnotts) which is a day cream, night cream and has the benefits of a serum too. I absolutely love this and am scared I'll run out of it when I'm away. I can't tell how much I've left! Next is a bit of make up. A foundation is only a foundation the same way a mascara will only act as a mascara, or am I wrong?! 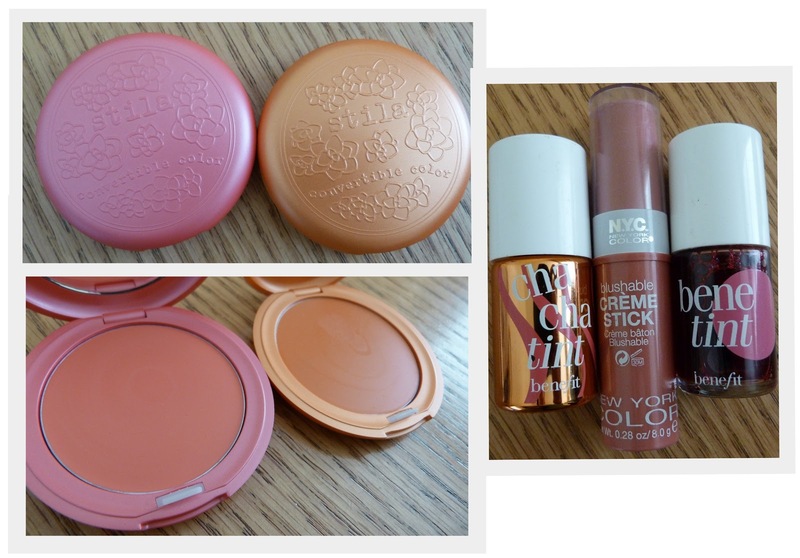 I'm a massive fan of the Convertible Colours from Stila and picked these two up recently in TK Maxx. You can use them on your lips and cheeks, happy days! Unless you've been living under a rock, you'll know I love the tints from Benefit, especially Cha Cha Tint (€33) and these can be used on the lips and cheeks. I'm rarely without Cha Cha Tint during the summer and this year will be no different. Finally on the cheek/lip front is the award winning Blushable Creme Stick from NYC. €3.49 will get you flushed cheeks and a gorgeous glow. Just trust me when I tell you to get one. If the NYC gods are reading this, please bring out a coral peachy colour. I will be your best friend forever. Next we have something that I posted about recently but had to share it with you again. The Micellar Cleansing Water from Nuxe removes eye make up along with cleansing your face of dirt and make up. It means you don't have to take a separate eye make up remover with you on holidays and if you feel this bottle is too big, then decant it into one of the plastic bottles again. You won't even have to label it because this has a gorgeous rose fragrance that you'll be able to spot a mile away. Next up are more skin products. On the far left is Soleil Protexion+ which is SPF50 and an anti brown spot fluid and you can read more about it here. It smells gorgeous and will have people wanting to smell your face. If you're lucky... Second from the left is from La Roche Posay Anthelios XL and it's an SPF50+ along with being a tinted cream. I'll be reviewing this next week after giving it a go in Spain but first impressions are really good! The two products in the photo on the right from Vichy technically aren't ones that have two functions but they do negate the need for powder to set your foundation so that could make them multi functional kinda? I was sent these a couple of weeks ago and it was like Vichy read my mind. They heard me say in my noggin "I know I'm supposed to wear SPF but why oh why does it have to be so sticky and slippy? It makes me not want to wear it under my foundation". 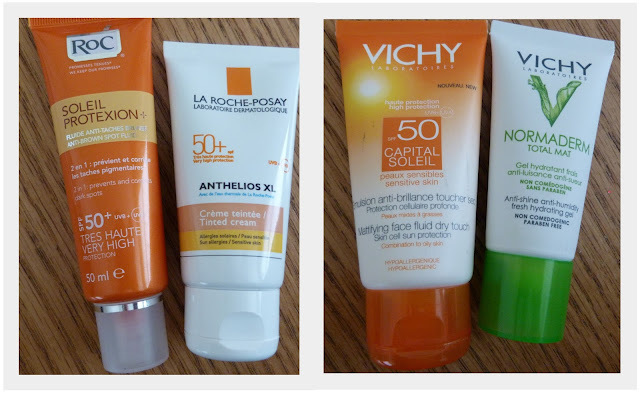 I've been seriously loving the SPF 50 Capital Soleil and I'll review them properly next week. Oily skinned gals keep an eye out for the review. Last but not least, for the beauty junkies who want to be able to do their nails on holidays. Sally Hansen Complete Care Extra Moisturising 4-in-1 Nail Treatment found it's way to my post box thanks to the Sally Hansen fairies who with their psychic ability, knew I've been having nail issues. More on that soon. I'll be testing this out and as you can see, it has four functions making it the winner in terms of numbers of things it can do! I wouldn't be surprised if it makes tea and changes the channel for you too to be honest. So tell me quickly folks because I'm leaving today to go on my holidays. What other multi functional products are there out there that'll help me pack more products that bit easier? I'll be back on Monday so don't miss me too much and Joanne will be keeping tabs on the blog! I'll respond to all the comments and emails when I'm back so chat later folks!! 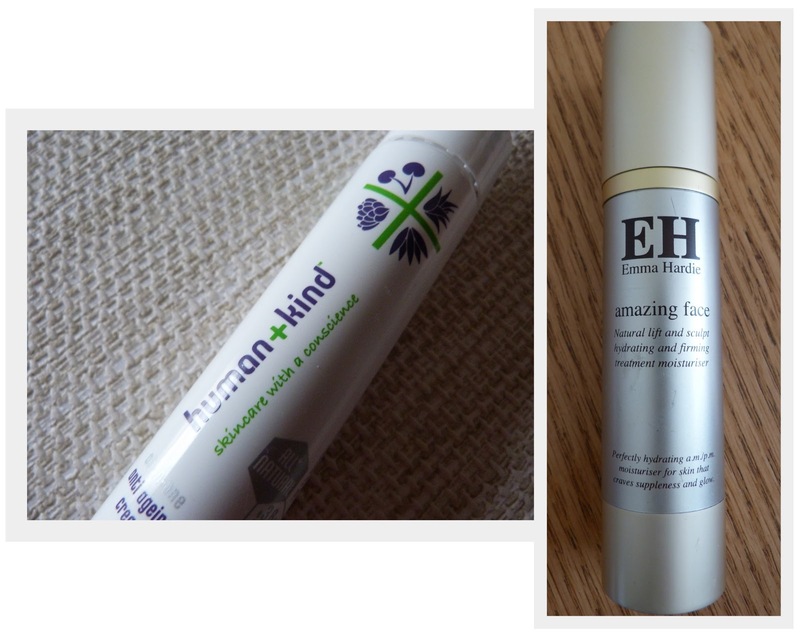 Great post karen,im notorious when it comes to holiday packing,always end up bringing too much.i recently started using eh am/pm moisturiser with the eh face serum underneath for daytime,hands down THE BEST investment in skincare i ever made,adore it,Has literally transformed my skin.really looki.ng forward to your review of the moisturiser.have you my tried the night cream from.the range?its going on wishlist!